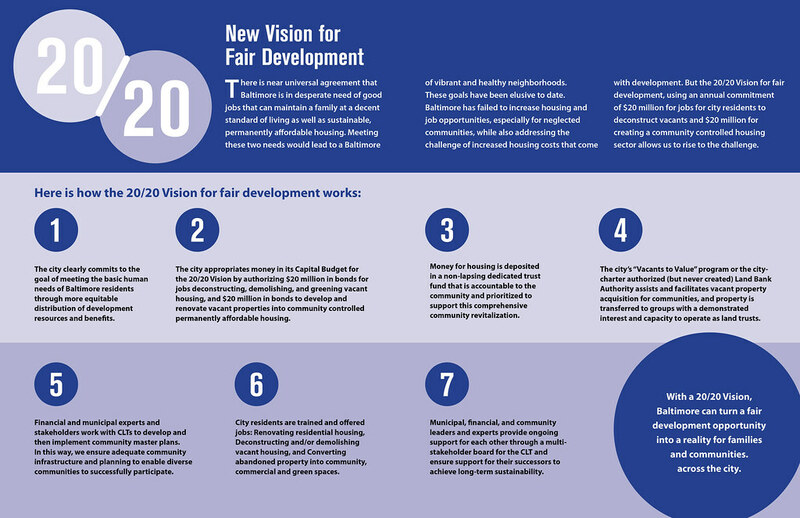 Sign on to the 20/20 vision for development without displacement! Pages tagged "community land trust"
BECAUSE: Baltimore development subsidies can better support neighborhood development and housing for working and low-income persons. BECAUSE: Too often, Baltimore’s development subsidies support commercial development focused on entertainment, hospitality, and retail businesses, which generally provide work that is lower-paying, making it very difficult for workers to live near their work or in thriving neighborhoods. BECAUSE: The City, through its planning and development policies, must invest in our residents to ensure that those with low-paying jobs, detention histories, lack of transportation and other problems finding full time work with benefits can afford rising rents and increased costs of homeownership. BECAUSE: Approximately one-third of Baltimore households are annually at risk of homelessness or are homeless. Commit $20 million annually in public bonds and other funds to create a range of permanently affordable rental and homeownership opportunities, including community land trusts, deposited into a community-controlled housing trust fund, and commit $20 million annually in public bonds and other funds to for capital programs like deconstructing vacant properties, creating green spaces and urban agriculture and other programs where people facing employment obstacles can be employed. Establish a Land Bank (already authorized by city charter) to dispose of vacant properties or reform the Vacants to Values program to assist neighborhoods and neighborhood based non-profit groups to acquire property. Ensure that jobs created by these funds support those returning from detention or homelessness and ensure Union certified training and prevailing wages, specifically designate apprentice positions, and ensure the right of these workers to organize. Commit additional funding for general operating and capacity building for nonprofit community development organizations. 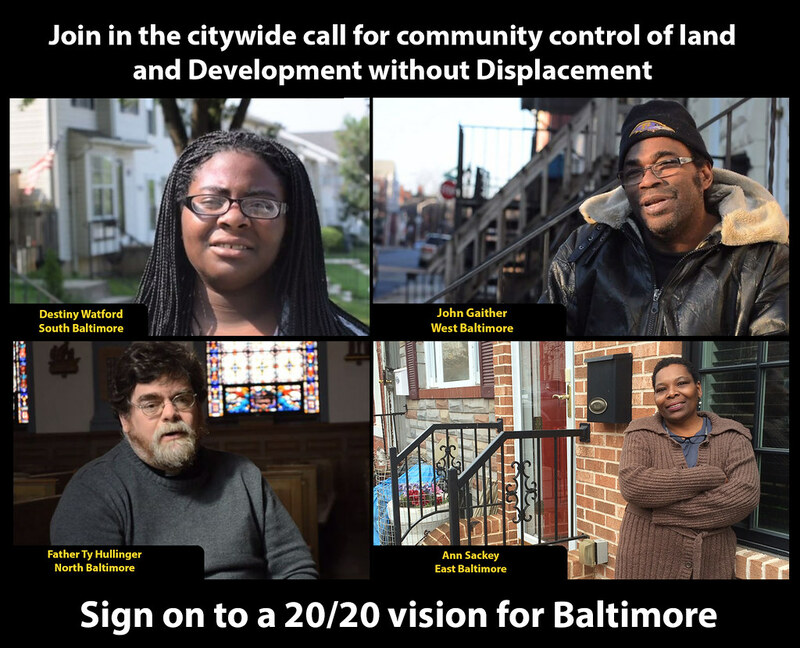 What are people in Baltimore saying about community land trusts and the 20/20 vision? Do Community Land Trusts (CLTs) pay local property taxes? Do CLT’s Negatively Impact Neighbors’ Property Value? Can CLTs own and control rental property? Do CLTs solve the problem of making low-income housing profitable? How Are CLTs funded and how do they sustain themselves?